When the Para-Ordnance LDA pistols first appeared several months ago I was somewhat skeptical of the concept, thinking it yet another “interesting solution to a nonexistent problem”, as some have referred to DA triggers in semiautos. After all, isn’t one of the things that makes the 1911 pistol such a perennial favorite among both defensive and competitive shooters that short, sweet, crisp single action trigger? You betcha! On the other hand, isn’t that trigger one of the things that gives police administrators and bureaucrats, as well as many novices, the heebie-jeebies when looking at guns for general issue/personal use? While no-one’s likely to challenge the 1911’s several marvelous qualities as a pistol, many will tell you that it’s a gun best reserved to use by expert shooters. Being a graduate of Gunsite and other courses with skilled instructors, I would amend that to those persons who’ve taken the time to be trained in the proper use of firearms, period. Of course, I carried a cocked and locked 1911 in one form or another for several years and am comfortable with the concept and the gun. So I was, as I noted, skeptical when they unveiled this 1911 with a long, looooooong trigger pull that was supposed to warm the flinty hearts of those who believed that only DA/SA (double action/single action) or DAO (double action only) pistols were suitable for cops, or the public at large. On the face of it, it makes sense for Para to try to find a way to bring such a thing to the market. In this age of liability and lawyers on the make, many folks would never be able to bring themselves to carry an SA pistol, even a classic such as the 1911, and if you’re in the business of selling guns then you have to find a way to get the business of those who’re convinced that a gun is only safe if it’s DAO. This is what they have set out to do, and so the LDA, or Light Double Action, also referred to as “Lightning DA” on their web page. Why LDA? Well, because as soon as you say DA most 1911 fans cringe and mutter to themselves “long, heavy, grungy, gritty, uck, uck, uck…..” and turn away. They (and I) made a somewhat justifiable association with DA triggers and BAAAAAADDDDDDD triggers. Some guns that are sold seem to have as their sole justification for existence the fact that they’re DAO, which is, of course, no justification to exist at all! So Para had first to let us know that while their trigger was DAO, it was a LIGHT trigger (is this the 1911 version of ‘less filling/more satisfying’, or beer advertising brought to guns?) and so more palatable to those in love with the SA trigger. AND it still features the thumb safety and grip safety of the original 1911A1, making it easy to secure against unintended discharges, and fast into action from the holster. I first examined one at the IDPA 2000 Nationals when Kerby Smith let me check out the gun he was using for the match. Nice overall feel to the trigger pull; relatively light and acceptably smooth. But then I watched him struggle through the match with the thing and was NOT inspired with confidence. Turned out it was magazine problems, and not the mechanism, but still it engendered doubts. I thought no more of it until I went back to work the 2001 Nationals this year and got to re-examine the LDA guns. Let me tell you, this time was a whole different ball game! First, Todd Jarrett was there for his first Nationals, and brought his personal LDA pistol with him to shoot the match. While chambered in 9mm (gamer! gamer!) and thus classified in ESP (enhanced service pistol) instead of CDP (custom defensive pistol, which is where 1911s belong – ooo-ah, SIR! ), it’s representative of what can be done with one if the shooter takes the time to do some simple tuning. The basic idea behind the LDA seems to be that you have a trigger with a long arc of movement that has a relatively low level of resistance to pressure from the shooter’s finger both through the stroke and, most critically, at the point of release. 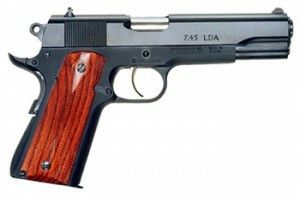 If I recall correctly, the LDA’s is rated at about 5-6.5 pounds, factory stock. But the pressure isn’t the key to the idea, it’s the combination of the length of the stroke and the sudden “surprise” trigger break that makes it special. A long trigger is going to be less susceptible to unintended firing, at least in theory, since the shooter is going to have to make a more deliberate effort to fire it. When you couple this long pull with a release that’s not too heavy you could achieve, in theory, a DAO trigger pull that’s got the best of both worlds – easy release (basic 1911 SA) with a longer pull not amenable to mistakenly firing the gun (the rationale for DAO, and what sold so many guns to police departments for S&W for so long). Picking up Todd’s personal pistol, I cocked it and dry-fired it a few times to see what was so different about his gun versus Kerby’s. It was obvious from the first stroke that it was MUCH lighter in pull weight and VERY smooth throughout the stroke and at the release. According to Todd, the pull weight on it is about 1.5 pounds – yes, one and one-half pounds! I could see quickly why he was doing well with it! I asked if it was reliable, and he said he’d been shooting it in competition for several months with ZERO malfunctions or repairs. Loading it up, I engaged the steel plates in the Para demo bay there at MISS (Mid-south Institute of Self-defense Shooting, John Shaw’s shooting school in Mississippi, where the last 3 Nationals have been held – http://www.weaponstraining.com) and found it exquisitely easy to shoot. As long as I watched the front sight and didn’t yank on it, hits came smoothly and quickly. Nice gun – maybe this concept has something going for it. Todd then took it apart and showed me the various places where he’d smoothed and polished the parts, and talked about the springs he’d changed. I didn’t take notes, just listened, but the gist of what he was saying was that the work he’d done wasn’t very complex or difficult, and could quite quickly be done by anyone of moderate skill and experience. Based on watching as he pointed things out, I would have to agree, though I’d leave it to a gunsmith since I have difficulty using tools smaller than a 3-pound sledgehammer. Oh, I can use them, but what happens isn’t pretty! I mentioned something about “yanking” the trigger, which I found was quite easy to do if I allowed myself to think about other things than “front sight, press”, but only for the first few shots. Anticipating a long trigger that’s also HEAVY, like most other DAOs are, many shooters will give it a yank at the outset, and thus reduce the accuracy they could achieve. Once the LDA trigger is practiced, the shooter learns that he only has to initiate the pull and then follow through smoothly. Of course, 1911 SA fans know this by heart, but this has been a shortcoming of DAO guns all along, including revolvers, in the hands of those who haven’t yet been shown the light. Fit and finish were good, natch, and the single stack configuration has taken care of the biggest problem that Paras have always had, in my opinion, which is magazine reliability in the double stacks. With the single stacks, you load up your Wilson mags and carry on as usual. Para does offer it in double stack versions, but I leave those to the folks who like carrying over 3 pounds of loaded gun and mags on their hips all day and spending money on Wolff mag springs. What is that they call that? Masochism? A chiropractor’s retirement fund? FWIW, my hands are large enough that I like the feel of the double stack frames, but I still expect them to feed and fire EVERY time, so I gave up on the P13-45 after a time. Just my opinion, of course. But back to the primary topic, the LDA trigger. Is it a good thing? Yes, very much so. Even with the super light release weight of Todd’s gun, the long stroke made it unlikely that a shooter would touch it off inadvertently, and certainly NOT as he might if it were a single-stage SA trigger set that light. Once the trained shooter has his finger on the trigger, the tactile feedback that he gets is going to allow him to gauge his pull speed and pressure. The stock guns, with their heavier stock pull weights, would be quite easy to manage even for folks without strong hands, and that can NOT be said of many DAO guns now on the market. In addition, the triggers can easily be reduced in pull without compromising the basic “safety” or intent of the DAO design. It does require resetting after each pull, so you can’t hit a shell that doesn’t fire twice by just pulling the trigger again, but shouldn’t we all be practicing malfunction (tap, rack, assess/bang) drills for that anyway, REGARDLESS of the weapon type? I hate to use the word “revolutionary” about guns and their design features, but this LDA trigger is a significant development in the evolution of the 1911 design. When set up cleanly and broken in, it’s smooth and very easy to shoot, and it provides that mystical “surprise” trigger release that we all talk about. Out of the box, it would do to carry, if the ones I shot were truly representative of general production. If I had one nit to pick on it, it’d be that it requires a fairly long forward return stroke to reset, and I don’t think that’s something that can be gunsmithed out of it in the short run. However, shooters like Todd Jarrett have made it plain that the reset, as it is, is NOT an obstacle to really fast and accurate shooting. So that may well be just a personal caveat that would go away with time spent with the gun. Final word in this review? The Para Ordnance LDA trigger works very well – smooth and manageable and BANG! – it’s there! Additionally, the 100,000 rounds Todd’s put through his personal gun pretty much proves that it’s reliable in its’ present form. For anyone craving a .45 like John M. Browning intended, but saddled with a bureaucratic mandate, or personal desire, for a DAO pistol, this could well be the answer.